The Outer Banks contain many popular destinations, including the Wright Brothers National Memorial, the Fort Raleigh National Historic Site, and many historic lighthouses. The North Carolina Coast is known for much more than its great sand and surf. It is a place rich in history of pirates, battlegrounds and sunken ships. The Brunswick Islands give you an ideal range of things to do and places to stay, from lighthouses to historic sites to miles of uncrowded beaches. Each island and town is a unique destination and they make for a perfect family vacation. The Blue Ridge Mountain region of North Carolina is home to eight ski resorts, and Cherokee is a vacation destination with museums, amusement parks, casino, hiking trails, and scenic drives. 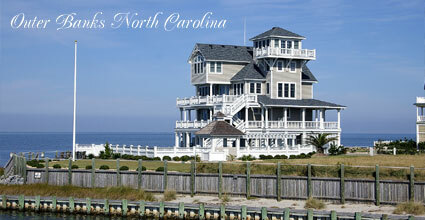 Places to stay in North Carolina, choose from Vacation Homes, Ski Resorts, Beachfront Cottages or Condos for Rent. Contact Real Estate and Rental Property Management Companies, Private Home Owners, or Rental Managers for short term, seasonal house rentals, availability, summer rental rates or vacation rentals information. Near the many North Carolina Vacation Rentals, in addition to the natural beauty of the beaches, area dive shops offer charters offshore along our sea floor. Enjoy a horse ride along the beach or opt for scenic nature rides along trails. The North Carolina Atlantic Coast is called the windsurfing capital of the East Coast. For more places to rent and vacation rentals near North Carolina, you may want to check out our Myrtle Beach Inns or Virginia Beach Cottages. Or, take a look at other Vacation Homes & Resorts, vacation travel destinations and holiday getaways.